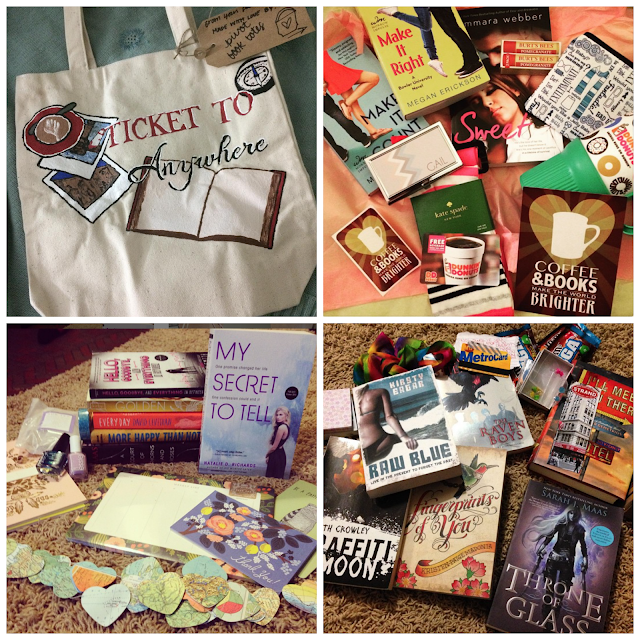 I'm SO excited for the 3rd round of On the Same Page Secret Sister Project! If you don't know what this is, it's described as a "secret santa, but longer". Basically, you get a sister that you are supposed to send notes and little gifts to for 6 months. You can reveal yourself whenever you want, but I found it really fun keeping it a secret until the last month. Also, there are 3 different tiers you can choose from so that it won't be overly pricey for you if that's an issue. The main goal is to let someone know you're thinking about them, so if the money thing is holding you back, I say don't sweat it. If you can afford the cost of stamps and maybe have some ARCs or other books you wouldn't mind parting with, that's perfect. Also people sent baked goods and stuff they made, so it doesn't need to be about the money you spent, it's about the love. This past 6 months, I had Gail from Ticket to Anywhere. I absolutely had the best time getting to know her and buying things for her. I loved that I wasn't that familiar with her beforehand because it was so fun getting to know someone! Not that I would've minded if I already knew the person, but it made it more challenging... and I liked that. Also we don't read a lot of the same type of books or follow the same fandoms, and it exposed me to so many new (and cool) things- because I had to research things to figure out what I was buying. I also can't wait to get to know the girl who had me. She was a nice sister as well! Above are pics of packages I sent and ones I received. I borrowed the ones I sent (top row) from Gail's Instagram. If you want to sign up- go here!! Sign-ups end tomorrow, so get working on your survey!! Summer Showdown!!!! My book club is halfway through the annual FYA Summer Showdown & we're having a blast. It's just as much fun this year as it was last year. The Monday puzzles and weekly challenges- taking photo hunt pics (cover recreations), I love it! We're in 4th place right now... but the competition is tight and there are 23 teams!! Above are some of my favorite photo hunt pics we've done so far. Well due to the Showdown, I am (and most of my book club are) now obsessed with Polyvore. When I say obsessed, I mean obsessed!!! 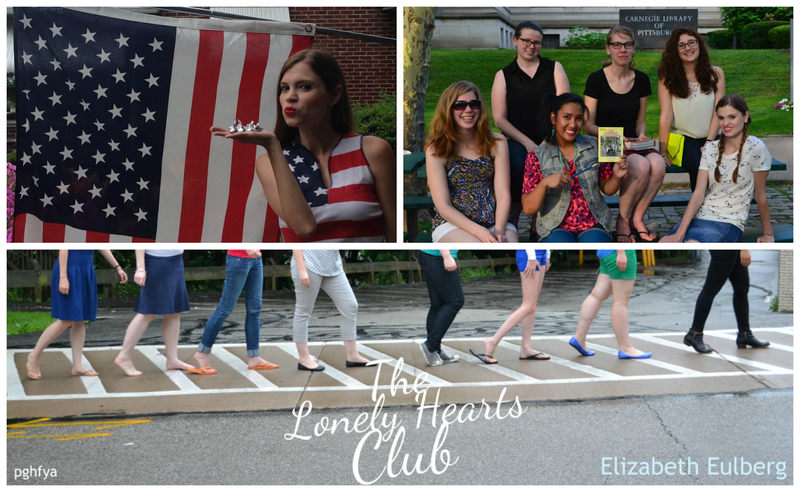 One of our weekly challenges was to create outfits for YA book characters... and once we started, it was like we couldn't be stopped. I know one thing... I'm going to be making outfits for book characters for a long time. I might even have to turn it into a blog feature-thing. All grown up, but still rocking that Unicorn Club charm on the Chanel bracelet daddy bought her. So I'm a little late to the party, but I got my first Funk Pop! Of course I couldn't pass up this adorable Harry Potter guy. Isn't he precious?? And now I need the other 6 HP figures. 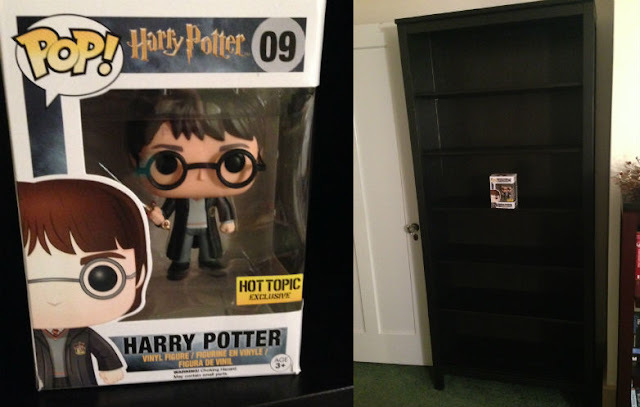 Oh and there he is in my BRAND NEW bookshelf. I'm going to have fun choosing what to fill this one with! Right now I'm reading Lois Lane Fallout by Gwenda Bond. It was sort of a impulse pick up at BEA, but I'm really really liking it so far. Also I really like that the pages are a little bit thicker than in a usual book. I don't know why that matters, but it feels so important or something when I'm turning the pages. 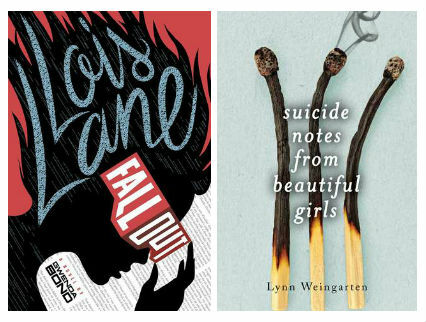 I also just finished Suicide Notes From Beautiful Girls by Lynn Weingarten. I met her at BEA and just LOVED her. I really liked Wherever Nina Lies, but didn't end up loving this one as much. Seriously though, if you've read it, can you maybe message me on Twitter (@Pinkplkadotblog) and let me know what was up with that ending!! I'm in serious need of explanation! So tell me about your obsessions!! Anything good on Netflix that you've been bingeing? Any good books you are addicted to? Do you use (and love) Polyvore? Thank you!! My book club is a blast. I love this summer challenge thing that FYA does. It's made the summers so awesome. Polyvore is definitely easy to spend hours on! 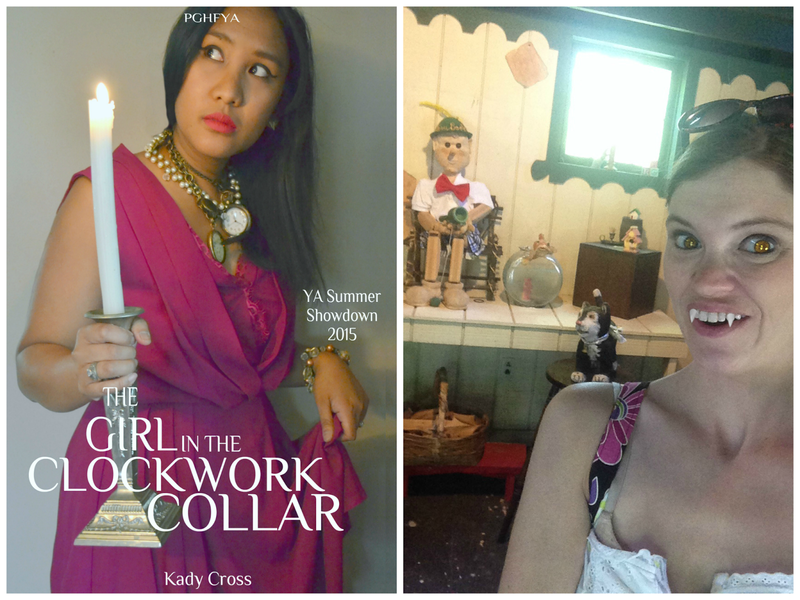 The Lonely Hearts Club and Clockwork Collar recreations are AWESOME, and the others are really cool too! I've never actually seen the Harry Potter one so that's really great, I'll have to keep my eye out for it! *sigh* I so want to read Fallout. It looks SO GOOD.